Parsnips, peppers and black beans with rice • Quick & Tasty - Get Cooking! 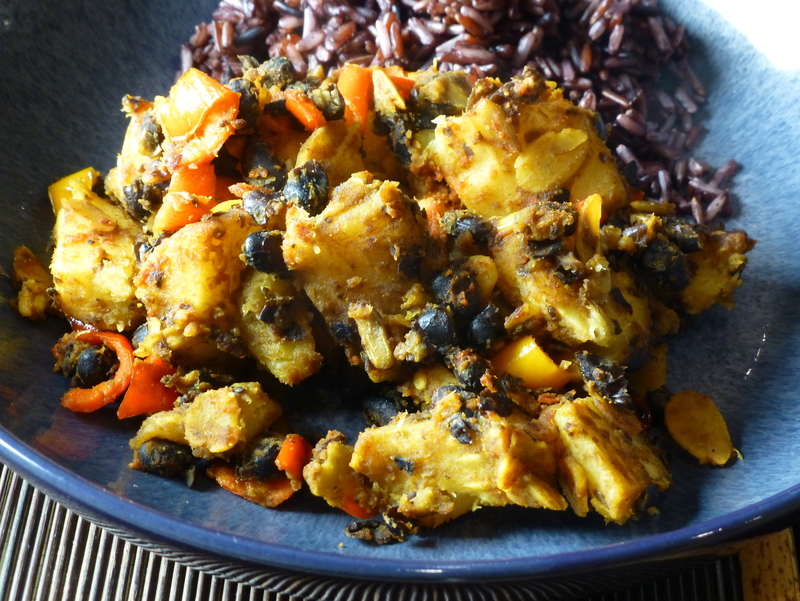 This is a simple, colourful and very tasty stir-fry of parsnips, baby bell peppers and black beans, served with rice. The “secret sauce” is almond flakes and tomato puree. In our local Chinese supermarket I found “Healthy Grain Trio Rice”, a mixture of brown, red cargo and black glutinous rice and a very nice combination. Heat the olive oil and when hot, stir-fry the ginger and seeds over medium heat for about a minute. Add the beans and fry over high heat for a minute. Then add the parsnips and peppers, fry over medium heat. Stir in the tomato puree and drizzle on the garlic oil.